Cable and satellite companies understand that you might want to move content around in a streaming fashion on your IPTV network. They offer multiplexed IP packages of channels, and you just need to add some hardware to move individual channels. One IPTV network of note: City University London. The school recently deployed an Exterity IP video system, which facilitates the streaming of HD video material to all staff and students throughout its central London campus. What tech managers need to know about legal streaming over IP. Colin Farquhar is the CEO of Exterity (www.exterity.com). Over the past decade, Video over IP has emerged as the video delivery method of choice for a wide range of professional organizations across a variety of verticals looking to modernize their AV and video communication services. 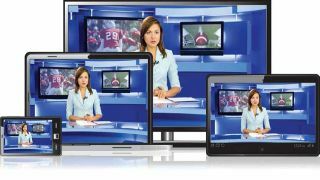 This enables organizations to provide access to multiple live TV news channels to inform decision-making, and enables staff and visitors to receive high-quality video content on fixed screens and mobile devices. Meanwhile, tech managers are implementing professional IP video systems as a way to improve training and communications with staff, reduce travel costs, and build new revenue streams through developments such as targeted advertising. As high-quality third party content is increasingly part of the AV mix, organizations need to make sure that they are accessing and distributing content legally and adhering to copy protection and anti-piracy regulations. At the same time, they must ensure that the IP video solution they’ve chosen works seamlessly throughout their premises, and that specific content can only be viewed by those who are given access. Tech managers can accomplish the first task by requiring the full protection of content as it is distributed through their organizations to fixed screens and connected devices. This means implementing precise security systems such as SecureMedia encryption and High-bandwidth Digital Content Protection v2 (HDCPv2)—which prevents the copying of digital audio and video content as it travels across connections. Developed specifically for IP distribution, HDCPv2 provides robust protection for video transmission over one or more links in a network. HDCPv2 is essential for an IPTV system to stream content from HDMI video sources. It is also the international standard for content protection for delivery over IP. With this in mind, AV equipment vendors and solution providers should ensure that deployed solutions can meet today’s increasingly exacting digital content protection requirements by embedding HDCPv2 into head end and receiver clients as well as enabling head ends to handle all types of broadcast signals without degrading picture quality or service as IP video solutions become more widespread in the industry. This challenge is relevant for professional IP video systems in a variety of settings, from a world-class sports stadium seeking a flexible real-time video delivery infrastructure to a higher education institution looking to stream video to students. Though they vary in size, scope and function, all these organizations need to make sure that they are not susceptible to content theft. Benefit from peace of mind, knowing that all their streamed content is fully protected and around your facility, in an encrypted fashion, of course. One way to do this is with a decryption card plugged into your local receiver, but sometimes you want to deliver content to a desktop, which means you need another option. In that case, check out Haivision’s Furnace IPTV ecosystem. It will require a bit of extra negotiating with the content providers, who will be providing an unencrypted parcel of their channels for distribution throughout the facility, but all involved can rest assured that Haivision’s very own AES-256 bit encryption will protect the content throughout the seamless distribution process. A lack of server space, bandwidth limitations, and an already stretched network team are among the battle cries when it comes to streaming media. Chris Imming, CTS-I, CTS-D, Director of Media Services, Classroom Design at Gordon College, agreed with that sentiment. “If we have to do something that’s really important, we unicast out to a content distribution network, and have them do the multicast.” When Imming needs to live stream high-profile events, “we broadcast our graduation so people in the audience can pull it down on their iPad or phones if they want,” he said. “They are pulling network off the cell tower, and not using our bandwidth.” Gordon College looked at having a streaming media server but decided not to manage its own. Instead, Imming noted, “we outsource a server because it’s a scalable solution for us and it’s one less thing that the network team has to support.” Whether an institution of higher education, a corporate facility, or a traveling event, streaming media is seeing some transition to the cloud. When TourGigs, a concert film technology company specializing in live streaming and concert videos decided to offer live over-the-top (OTT) concert streams on a pay-per-view (PPV) basis, they knew they would have to provide users with a premium experience and value for their money. “This meant high-quality adaptive bitrate streaming across a variety of formats and devices,” said Casey Charvet, director of Technology at TourGigs. “We needed a product that was stable, scalable, and designed to take a single field contribution and produce multiple renditions. We also needed a product with a price point that fit our budget and could scale elastically with our production frequency. We knew down the road we would have expanded content offerings like streaming on-demand from our archives, so it was a great benefit that Wowza supports this and more.” Before Wowza, TourGigs had relied on third-party end-to-end streaming platforms. “None of these could meet all of our needs, so we engineered our own solution with Wowza as a core piece,” added Charvet. QMOD-SDI HMDI Contemporary Research ● Spend some time thinking about your intended audience and what they are expecting in addition to what you plan to deliver. ● How will that change over the future? ● Does the service or software accomplish those goals now, and will it grow with your needs? ● Resources: How much is your organization willing to invest, in both finances and manpower, toward building and managing a live streaming workflow? How quickly do you need to launch a new infrastructure in order to meet your business needs? The Exterity system enables the City University London to continuously record international channels relevant to each faculty, allowing students and professors to use relevant content, regardless of the course. By incorporating a satellite dish and Sky receivers into the IP video mix, students and faculty members can also watch the university’s Sky Sports subscription services, while Exterity Encoders enable on-campus channels to broadcast their content from any location on the network, ensuring that entertainment and education content can be shared throughout the university. This even lets City University offer live basketball matches and international lectures held on campus.